Screenleap For Support allows your customers to easily share their screen with your support reps, so your customers can receive faster, more effective support. Viewing a customer's screen is a snap: your support rep simply needs to click a button on the support dashboard to start a new support session and then send the generated share link to the customer. Once the customer clicks on the link and goes through a quick app install, your support rep will be able to see the customers's screen. If you're in touch with your customers by phone, you can direct them to click a link on your website that takes them to a page where they can enter a share code. Once they enter the share code that you tell them, they will share their screen with your support reps after a quick app install. Give your customers an incredible support experience. Eliminate miscommunications and back-and-forth emails. A picture is worth a thousand words. This is especially true when it comes to customer support as customers often have a difficult time describing their problems: they end up emailing support with unhelpful messages like "the site doesn't work" or "the app keeps crashing", which results in a time-consuming back-and-forth in an attempt to understand the problem. Screenleap eliminates the back-and-forth by allowing you to quickly see your customers' screens and watch as they show you their problems in real-time. Turn support from a cost center into a profit center. Screenleap not only helps you lower support costs by reducing back-and-forth emails, but you can also turn support from a cost center to a profit center. Having someone available to walk your customers through a complicated checkout process reduces shopping cart abandonment and leads to fewer failed transactions. In addition, your support reps will have the opportunity to upsell your customers after helping them with their issues. 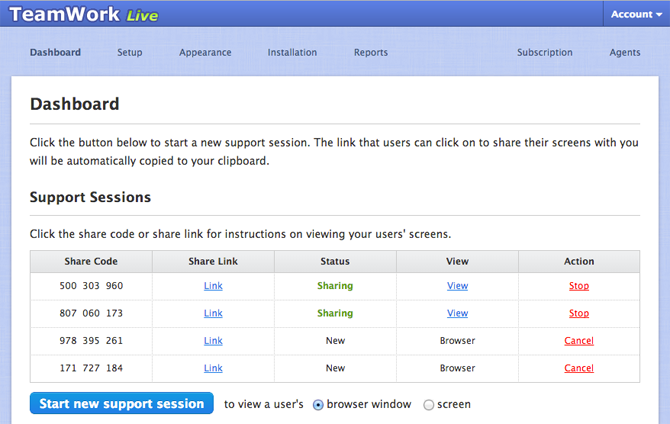 Screenleap For Support is built on top of our quick & easy screen sharing service. We provide you with an all-in-one solution that allows your customers to easily share their screen with your support team. Allow your users to initiate screen shares with you with a single click. Viewing your user's screen is easy: all you need to do is send a link for them to click. Integrates easily with your website. For those of you who can't easily send links to your users, we also provide an embeddable support widget that you can integrate into your website. Your users can initiate a screen share with your support reps by simply clicking the button in the widget and entering the share code that the support rep tells them. Manage your screen shares from a centralized dashboard. Your support reps automatically get notified of new screen share requests from their dashboards. They can view a users' screen with a single click and can even switch back-and-forth between multiple screen shares. Choose the best sharing option for your needs. We offer multiple ways for your users to share their screens. If you are supporting a website or web app, you can take advantage of our browser extension that allows your users to share their browser window with you in seconds with just a couple of clicks. If you need your users to share their entire screen, you can take advantage of our Screenleap for Mac and Screenleap for Windows apps. Start your free 14-day trial today and see how much more effective your support interactions becomes.